Hi friend! As you may have read here, I’m speaking to a group of business owners about blogging this week so I decided to publish the questions that were sent to me ahead of time here on the blog. I wanted to work through my answers ahead of time to help me prepare, have them all written out to point attendees to after the talk, and I thought it might be nice to share them with my regular readers too! So I’d love to share with you today more on who I am and my purpose and passion behind the blog If you are a blogger as well, I’d also love to hear all about you and your blogging journey in the comments below! 1) How did you get into blogging? What made you decide to start? I am a counselor by profession and have always had a heart for those in need, so when I learned about the blogger programs hosted by ministries like Compassion and World Help, I knew it was something I really wanted to do. At first I didn’t blog about anything beyond the assignments they gave me – but I fell in love with blogging so much that I did eventually branch out! I honestly never planned to become a blogger but I am a true people person, so blogging has been a great outlet to communicate and connect with others. My hope is for this space to serve as a platform for friends to stay in touch, to form new connections with people I’ve not yet met, and to document all that I want to remember in the living of this amazing life. 2) How did you decide on the name of your blog? Did you ever have any others in mind or was She Lives Free “it”? It came to me right away, I never even considered anything else! My husband loved it too so I just knew it was meant to be 🙂 The ‘She’ is intended to include all women. I have always wanted my blog to be a dialogue, rather than a one-way conversation. I want others to be able to see themselves in my story and a reflection of our Creator, who is writing each of our stories! 3) What tips or advice would you give to a woman just starting out in the blogging world? Above all – know your purpose in blogging. This will save you much frustration and disappointment if you have a clearly defined “why” behind all that you do online. Write as much evergreen content as you can. These are on topics that keep people coming back again and again. Examples include topics that encourage, inspire, uplift, educate, entertain, and the real biggie – topics that solve problems for your readers. These topics are very others focused, rather than you focused. In otherwords, an evergreen post is not one on what is going on in your life, rather it’s all about serving your readers in some way. Use storytelling to connect with your readers’ stories. I try to introduce the topic of my blog post with a personal story or anecdote that will make the topic of the post more relatable as often as I can. Take ample time to create compelling images that demonstrate how your post will add value and will capture the attention of viewers on social media. I have learned you simply cannot overstate the value of well crafted images. Link within your posts to other posts you’ve written on similar topics. This will not only help your readers find related content, but it will also increase your page views organically. Close your blog posts with a question or series of questions to help readers connect even more with what they read and fully internalize the message for themselves. Join and interact in as many groups online as you can! This allows you to get to know other bloggers so that you’re not blogging in isolation and you have others to collaborate with. This also gives you an avenue to share your posts and see others work as well. I am a part of many blog related groups because I see it as paramount to my blogging journey in so many ways. I list a few of my favorite groups here. 4) How have you connected with other bloggers? How has that benefitted you as a blogger, as a woman, and as a believer? What does the blogging community mean to you? Three main ways: 1) Facebook groups 2) Instagram 3) The Influence Network and it has made all the difference as a blogger, woman, and believer! I started blogging not quite a year and a half ago, but I have already found lifelong friends through these avenues simply through spending alot of time hanging around them 😉 One thing I say again and again is how blessed I’ve been through the blogging community – never could I have imagined all the ways blogging has changed my life. Hang in there and the Lord will bless your journey too as you follow His leading! 5) You write for other publications in addition to your blog. Did you seek that out for yourself or did those places approach you? What would you say to someone looking to write beyond their own blog? I have written for The Well Studio, The Huffington Post, and other blogs. Each opportunity I have always set up through contacting the editor or owner of the site. I think with a little research on how and where to make contact, this is something anyone can do and I would definitely encourage you to do, regardless of how long you’ve been blogging! 6) How do you decide what content you want to blog? 7) Could you share some ways you’ve been able to stay consistent in your blogging? How do you make time for writing as a busy woman, wife and momma? It is not easy and each week shakes out a bit differently, but I would definitely say my secret weapons are flexibility, adaptability, and perspective! I am also blessed with a supportive husband, children, and extended family who all pull together to help me find margin in my life to write. 8) What are your favorite resources for blogging? Right now the tools that help me keep it all together are Boomerang for Gmail, BoardBooster for Pinterest, and my new VA 😉 Ha! I’ve written extensively here and here on most all my favorite resources for bloggers. 9) How does social media tie into blogging for you? Being immersed in the world of blogging and social media can fuel comparison like few other things can, and comparison kills contentment. It’s wonderful that we’re all in this together, and I love so many things about that camaraderie! Yet I have found I need to “keep my eyes on my own paper” or I can start to question whether I should be doing what everyone else is doing. I believe that social media and all things internet can be used to bring great glory to God when we steward our online well. For more on learning to use your online influence for good, click here! 10) At the end of the day, what would you say is your blog’s purpose? Do you go into each post with that mission / intention in mind? Or do you let yourself share whatever your heart desires in the moment? She Lives Free is here to encourage living life on purpose, to the glory of God. You will find posts here sharing both the broken and the beautiful moments in life. She Lives Free is a place for exploring what it looks like to live free, through the freedom found in Christ alone. Sometimes we talk about learning to live a life of abundant health as we seek balance and wellness. Often we discuss the joys of giving, volunteering, advocacy and even what it means to raise raise servant-hearted kids. Those themes will sometimes lead to deeper discussion on global issues like orphan care, adoption, foster care, and modern day slavery. There’s also no shortage of the fun stuff to be found here like gardening, crafts, fashion, and photography. 11) If we left here with just one piece of advice, tip or tid-bit relating to writing / blogging… what would you want that to be? 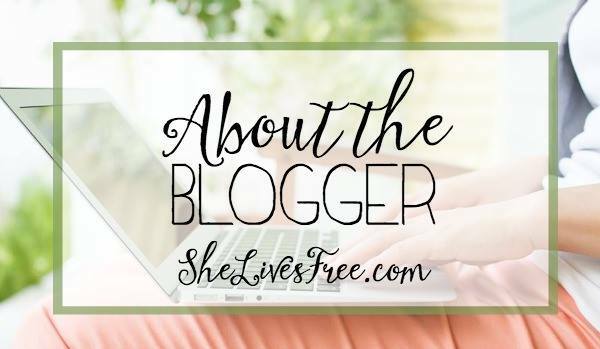 To read more on the purpose and passion behind shelivesfree.com, feel free to visit my about the blogger page, my about the blog page, or this post all about the blog and the girl behind the blog. If you’d like help discovering more about your blogging or business purpose & plan, join us at the Solopreneur Startup Lounge where we equip, encourage, and educate entrepreneurial types to create the life they want! I’d probably buy a dress and maybe some skirts. Hmmm… I really don’t know what I would buy! I have NEVER in my life bought anything from J.Crew! It would be fun to, though! If it works at the J Crew Factory stores, I would probably buy a striped knit cardigan. If it doesn’t, probably jewelry or a scarf. Either a dress or a swimsuit! Great insight and advice…thanks for sharing your experience with us. Monica recently posted…What’s Meaningful to You? ?